Tesla Model 3: What paint colors will be available and most popular? After Tesla confirmed more information about the Model 3’s options this weekend, we are starting to have a much better idea of the options that will be available when the vehicle makes it to production in July. Even more so when it comes to color options because of the Model 3 release candidates spotted to date. While it doesn’t mean that all the colors spotted on the release candidates will make it to production, it’s the best indication we have at the moment. It could mean that the Model 3 release candidates that we see from now on will have been painted with the final production paint shop. Now that a Signature Red Model 3 was spotted last weekend, there are six different colors on the Model 3 vehicles in the wild today: white, black, silver, red, blue, and Signature Red. Before the red and silver prototypes were spotted over the last month, the blue color on the Model 3 led our poll of preferred colors. 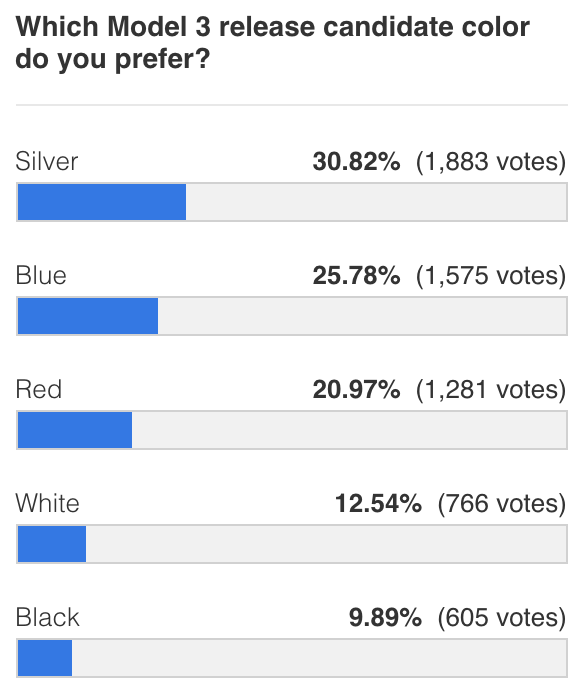 It was surpassed by red, but when silver was spotted earlier this month, it stole enough vote from red to make blue the second most popular choice. Let’s take another crack at the Model 3 color poll now that the Signature Red Model 3 was spotted. Keep in mind that if the Signature Red makes it to production, which again is not guaranteed, it will likely be for the “something special” for early reservation holders that CEO Elon Musk promised. Therefore, it should only be available to people who reserved the first day or so. Since Tesla confirmed that they plan to limit the number of configurations to fewer than 100 compared to the Model S’ more than 1,500 different configurations, it’s unlikely that more than six colors make it to production.